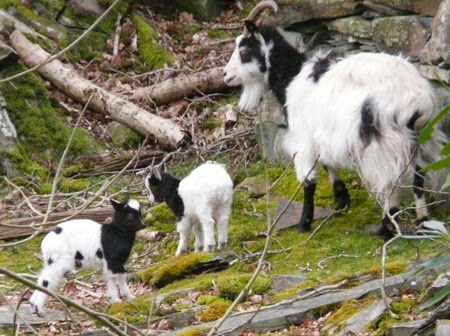 For the first time in many years our gang of goats below the railway line has had kids. In 2005 there were 6 adults and 1 kid – I don’t recall them having a kid since then, certainly not one that survived. In 2011 there were 3 males and 3 females but this year we started with just 1 male and 2 females. On Monday, as I drove up the drive, there was just the male and the older female. Had something bad happened? Or something very good? Driving up on Wednesday I could hardly believe my eyes, not 1 but 2 kids. Here’s hoping they survive the next few weeks and get our family back on its feet. For the moment their home is Pen y Clogwyn, the cliff top residence by the bottom hairpin bend. This time last year there were 2 kids born to the gang above the railway line. Every evening they could be seen in the steep bank of gorse. But then came the late and harsh winter. I remember seeing the 2 adult females, bleating as they searched for their lost babes. A while later I found the body of one of the kids; had it been separated in a blizzard and pounced on by a fox?